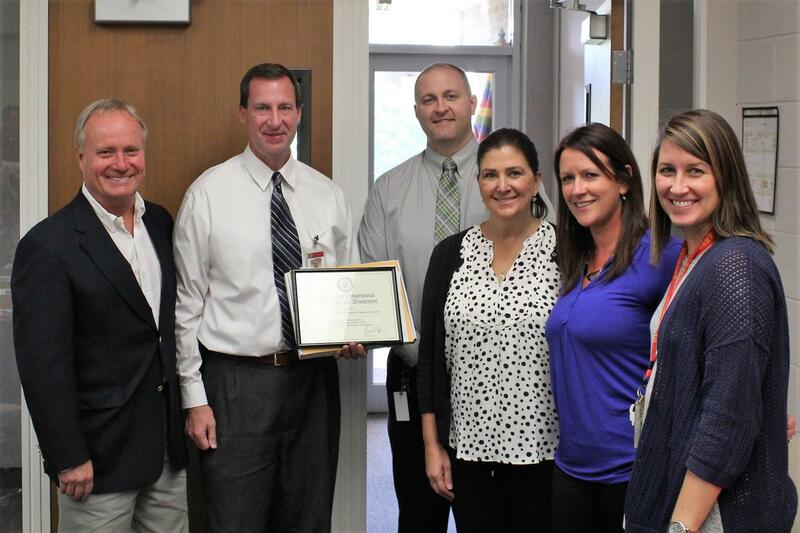 Congressman David Joyce visited the Brecksville-Broadview Heights City Schools Board of Education Office earlier this week, to formally congratulate the Middle School on recently being named a 2018 National Blue Ribbon School by the United States Department of Education. Congressman Joyce, who represents the 14th District of the State of Ohio, presented Middle School Principal Todd Rings and members of his staff, with a proclamation to commemorate this honor. He also spent a few moments speaking to the administrative team, including building principals and department heads at the Board Office. BBHMS was one of only 349 schools nationwide for earning such a prestigious honor, and the only middle school in the State of Ohio to win this honor. Two representatives from Brecksville-Broadview Heights Middle School will travel to Washington, D.C. on November 7th and 8th to receive a plaque and flag as symbols of its achievement, an event at which Congressman Joyce will be in attendance. The BBHCSD thanks Congressman David Joyce for stopping by the District during his busy schedule to recognize the Middle School for this honor.